Duesseldorf's international exhibition represents a unique opportunity to find out the latest technological solutions for packaging and other related processes. Since 30 years SMI has been proposing innovative, efficient, flexible and ergonomic solutions for the bottling and packaging processes which are increasingly inspired by the concepts of Industry 4.0 and Internet of Things (IoT). At Interpack 2017 SMI is exhibiting in world preview the new fully electronic, compact rotary stretch-blow moulder EBS K ERGON in ECOBLOC® configuration with a volumetric filler. The new EBS K ERGON series is available with 2, 3 and 4 cavities and allows the user to benefit from all advantages of the rotary technology in a range of outputs (from 3-4,000 up to 8-9,000 bottles/hour) usually served by linear blowers. simple and fast format changeover operations: the whole process is run by the MotorNet System® automation and control platform, which automatically adjusts the machine's working parameters when shifting from a production type to another. new design with modular frame, without welding, equipped with very resistant and long-lasting safety doors, made of tempered glass. At the stand 14D12 you will also find the latest technological solutions, designed by SMI, for end-of-line secondary packaging. 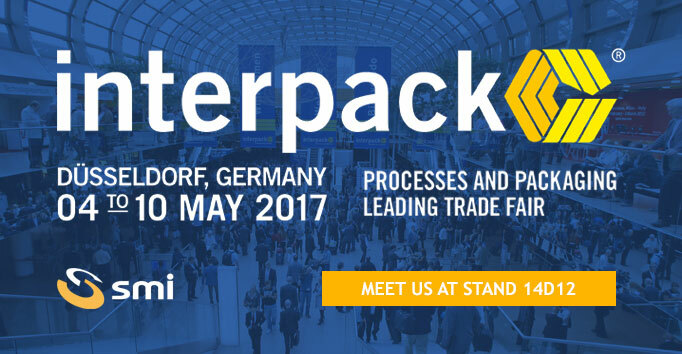 To get further information on SMI products, visit us at Interpack 2017 or get in touch with our sales office.